IMPORTANT ... Please keep your comments in english or slovenian. I do speak/understand bits of a few other languages as well, but not good enough to understand everything you are saying. I don't understand a word in russian or french for example and my italian is very limited too. So if you want to participate in a candy and you comment (which is optional but I really appreciate every single comment) the least you can do is to use one of the online translators (if your english isn't good enough to write a comment) and then write your comment in english. From now on I will delete all comments that are not in english or slovenian. I'm sorry if this sounds harsh, but comments and candy entries I don't understand and/or can't even read (in cyrillic) aren't really "my thing". This candy will close on October 31st and the winner will be announced the next day. Good luck to all of you! and I love so much ribbons!!!! 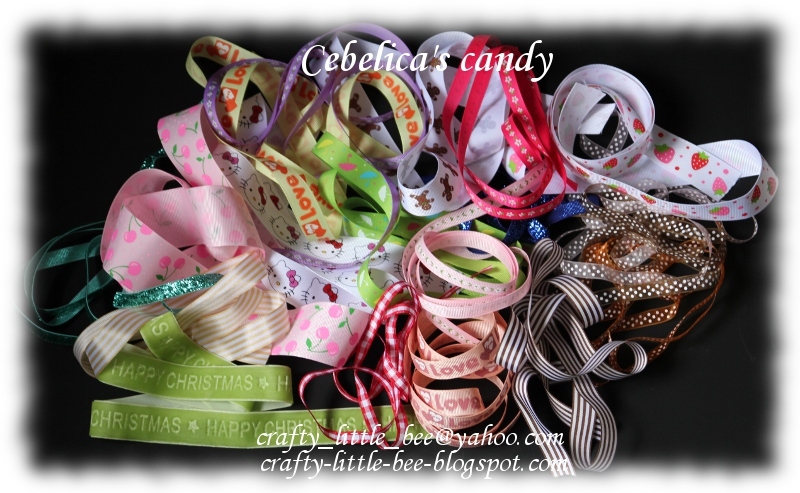 Beautiful Ribbons..Thank you for the chance to win...Posted your candy on my blog's side bar :)! I want to partecipe to youy candy! Thank you again for this wonderful candy (I LOVE RIBBONS, I would buy any!). Hugs from Italy! Can a girl ever have enough ribbons....I don't think so. What a Beatiful candy! !How many lovely ribbons wow! !I like it!Glad to join your blog! I soooooo love ribbons thank you for the chance to win!!!!!!!! Sidebar done, follower done and now off to Crafty ribbons :))) Thanks again! PS* I have some candy up for grabs too at Creations LaDiva :) Hope to see you there ! Love ribbons! Would like to win them! I will add myself to the list. Thank you! Zelo lepi trakovi. Hvala, ker lahko sodelujem. I love ribbons and always have something to make use of them. I am supporting this giveaway. Thanks for being generous enough to offer such gorgeous candy to win! I'll leave a link on my sidebar spreading the news for you. Wow, such a cute candy! Thank you for the chance to win this. I just found your blog and wanted to say I really like your cards, and that lace you made looks really pretty! Wow that is a LOT of ribbon! Thank you for the chance to win blog candy! Such a nice treat for anyone! LOVE the current challenge at Crafty Ribbons but just found it today so not really enough time for me to create a card. It takes me too long...lol. Beautiful ribbons! I really like! Thank you for the chance to win such yummy ribbons! Very sweet candy! Ribbons are beautiful thank you for the opportunity to win! trying my luck here :).. Thanks for the opostunidad to win these beautiful ribbons! I'm not very good at languages. But I hope to understand what I wanted to say) you HAVE a very interesting blog! Even though I'm from Russia but with pleasure I will take part in drawing of candy.